There is a calico cat that treads about our backyard like a fancy hobo. He’s scrawny and haughty both. I did this picture after a conversation my wife and I had about him. If you are the parent entrusted with bedtime story duties, perhaps you might conjure up a journey for him and see where he goes. These steps can help you organize events into causally related story moments. SON: Dad, can you tell me a story? DAD: Sure, um. I skipped breakfast this morning and went to lunch early. The End. Get some sleep. One day when I was a child I discovered I could eat three meals a day. And every day I ate a meal in the morning, a meal in the afternoon, and a meal at night. Until this morning. My alarm wasn’t set properly and I overslept and missed the first meal. And because of this, I was hungry all morning. And because of this, I held my stomach, sighed heavily, and scowled at my co-workers. Until finally, I could bear the hunger cravings no longer, and I got in my car, drove to Panera, and devoured all kinds of meat and bread. And ever since that glorious meal I have forgotten how to scowl, rediscovered the mysterious art of smiling, and most important of all, I have taken pains to set my alarm properly so that the hungry monster unleashed this morning might never rise again. The second scenario is entirely plausible. 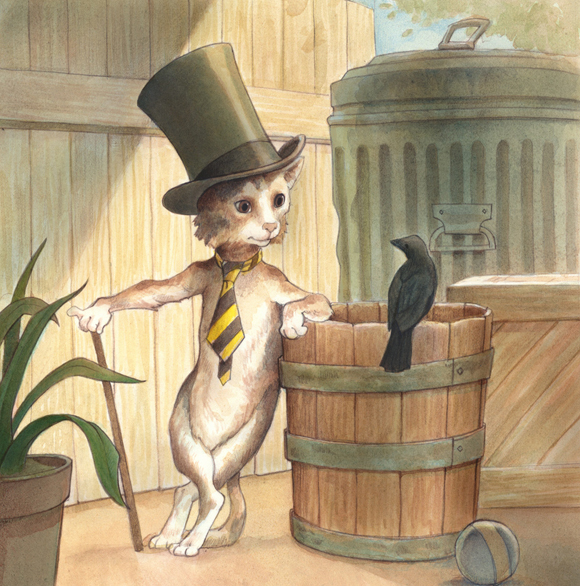 If you do end up telling a story about a cane-toting, necktie-sporting, top hat-wearing cat, drop me a line and let me know how it went. This is great, and I love the drawing! Thanks! I’ve since learned that Calicos are almost always female, but that’ll be our secret. Sir, this is pure gold. I’m just now seeing this, but most of our bedtime stories involve the bunnies who inhabit our backyard, so next time I might bring up the Calico cat! Usually we do rounds (our older kids are 5 and 3), and they each get a turn at making their own stories. Not every night, but most nights. Sometimes we do just say “go to bed!” after Bible & Prayer routine if things are getting late, but you’ve inspired me to make time to tell more stories with them! One day my children started asking me to tell them stories. And every time they asked me, I felt panicked, because even though sometimes the stories came out well, often they were weak, cooked in lame-sauce. Until one day I read this article by Zach Franzen. And thanks to this article, I laughed heartily. And thanks to this laughter, I remembered Brian McDonald’s tips for quickly structuring a story. And ever since then, even my lame and silly stories about everyday events hold my children’s attention, and amuse them unfailingly.